ATTENTION CAMPERS! 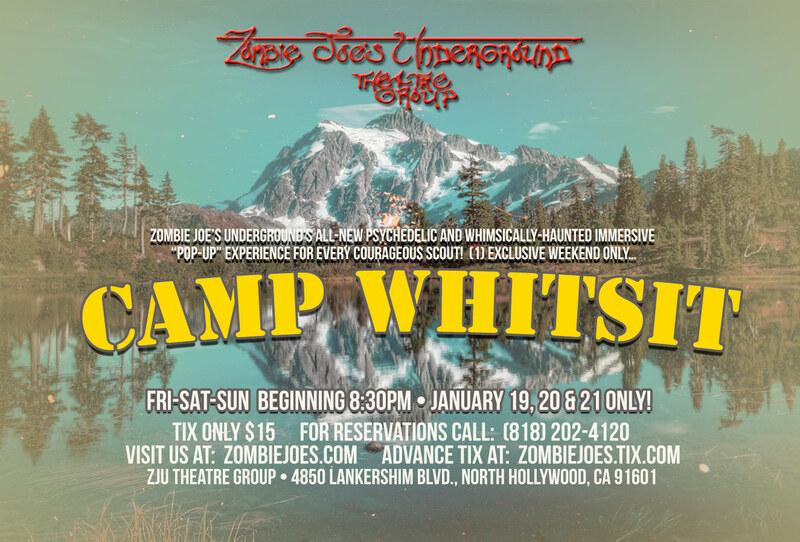 You are hereby invited to report to Zombie Joe’s Underground Theatre Group for their all-new, immersive experience – CAMP WHITSIT! This whimsical, coming-of-age immersive experience hearkens back to a simpler, more terrifying time and place where courageous visitors become Scouts through a journey of initiation and worldly merit! Based on actual events. Campers interested in taking part in the initiation process to become full-fledged scouts will be required to report to Zombie Joe’s Underground Theatre Group on one of (3) Evenings – (FRIDAY, SATURDAY & SUNDAY – Beginning at 8:30pm, JANUARY 19, 20 & 21, 2018). Upon entering, chaperones will be on-hand to offer campers the required standard release before entry. Once checked in, qualified Counselors will guide eager and courageous campers through a haunted-rite of passage that is whimsical, freakishly-strange, psychedelic…and filled with worldly merit! *This is a 20-minute immersive journey that will take groups of 1-3 people on a lightly tactile, fully interactive experience. One-Weekend Only: FRIDAY, SATURDAY & SUNDAY (beginning at 8:30pm), JANUARY 19, 20 & 21, 2018.